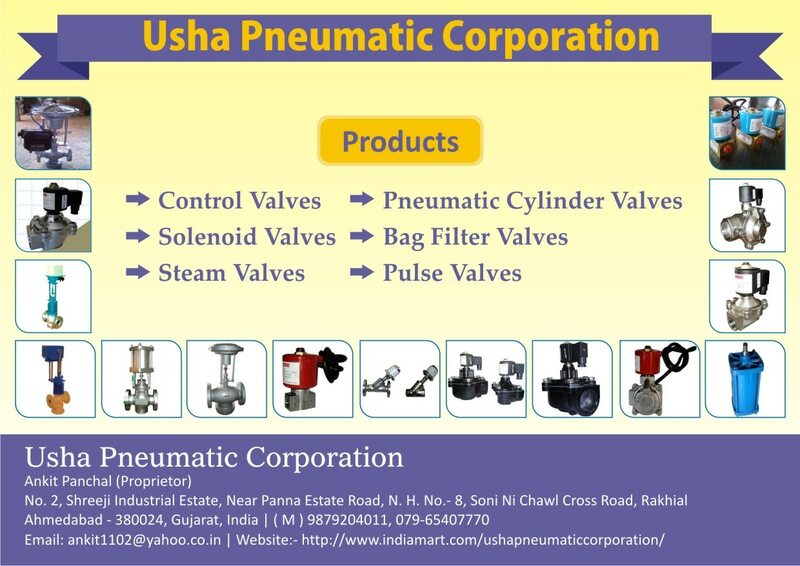 We are engaged in Serving the industry with the products Like Pneumatic Valves & Fittings. This all products are highly demanded in many industries like chemicals, Pharmaceuticals, Oil & Gas Plant, Steel Plants, Cement plants Etc. Our fastest selling product is PNEUMATIC DIAPHRAGM OPERATED CONTROL VALVE is one of the quality products which we are offering since many years. We have expert team and also developed our work area with advanced machinery and instruments. All our finished product passes through all possible tests so that our customer can enjoy the smooth working. More detals and specifications are mentioned below. Specification :- Type : Normal Open/close Size : 1” to 8”. Material : CI/WCB. Pressure : 16 BAR. Temperature : Upto 450 Degree C. Medium : Steam, Thermic Oil, Water, Chemicals.